As he tours to commemorate the 25 years (actually 26) of his post-Police solo career, Sting is also looking to his next phase, which includes a theater piece as well as a just-launched app geared towards the anniversary. Sting calls the forthcoming "The Last Ship" "a play with songs. I'm loathe to call it a musical because I don't like that term." He has 25 songs written so far for the project, which he describes as "a play set in my home town, in Newcastle (England). I was born in the shadow of a shipyard. I often wondered why I was exposed to this rather surreal environment when I was growing up, and I realize now it has a massive psychological and symbolic importance to me. That's the landscape of my dreams, my little home town and the house I was brought up in and the ghosts that were there." The plot meanwhile, is "a story of redemption and occupying a shipyard against the wishes of the owners - which is kind of topical at the moment, occupying things." Sting is continuing to write material and hopes to have "The Last Ship" "on the road in a year's time," preferring to make it a traveling piece rather than into a theatrical residency. "I think we should start somewhere," he explains. "There's a lot of excitement about it from people in the business. I go from being quietly confident to being noisily despondent - but that's the creative process. It's a very difficult thing to do... It's a very, very concise form, and it's all about stripping everything down to its bare essentials - the narrative, the song, what people say. So I'm finding it very absorbing and difficult, and it takes up most of my waking life and a lot of my dream life at the moment, which is interesting." That, of course, exists alongside the 25-year commemoration, which has included a couple of recorded projects - the "25 Years" box set and a "Best of 25 Years" single-disc set. 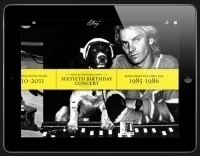 The free app, meanwhile, offers a digital documentary of Sting's solo career with 10 chapters of multimedia content such as interview clips, photos, memorabilia and concert footage - including from Sting's 60th birthday concert and Rainforest Foundation Fund benefit in New York City. "It's largely retrospective, this app, but it's very full and can also be constantly updated, so it's not a static thing. It's organic," Sting notes. "I'm not normally a nostalgic person. I think nostalgia is a kind of sickness. And yet, having survived 25 years since the Police is a sizable amount of time, and I think it did deserve to be recognized as such. It was a nice experience to look back and ask the question, 'Well, have you done good work?' And I say, 'Yeah, I have,' and I'm proud of it. I've had a remarkably successful 25 years, and what I've chosen to do has largely coincided with popular taste, even though my instinct was just to do what I wanted and what interested me. So I have no complaints in any regard." 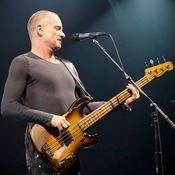 As for another traditional album, Sting acknowledges that "it's hard to know what the new model is. I think the app is the new model. People are going to stop buying CDs. People are going to stop selling and making them, so I am looking for different ways to get music to people, and the application at the moment seems to be the favorite." Sting's "25 Years" North American tour continues through Dec. 10 in Vancouver, including multi-night stands there and in Houston, Los Angeles, San Francisco and Seattle. And as he turns his sights forward again, he says that another Police reunion is an unlikely prospect. "You know, it's something I am very proud of but I'm not sure there would be a reason to open it again except for nostalgic reasons, and I think we did that" in 2007-2008, Sting says. "I thought we did it very successfully. The timing was perfect. Everybody was happy to see us. So you know say, 'OK, let's close the book...' "